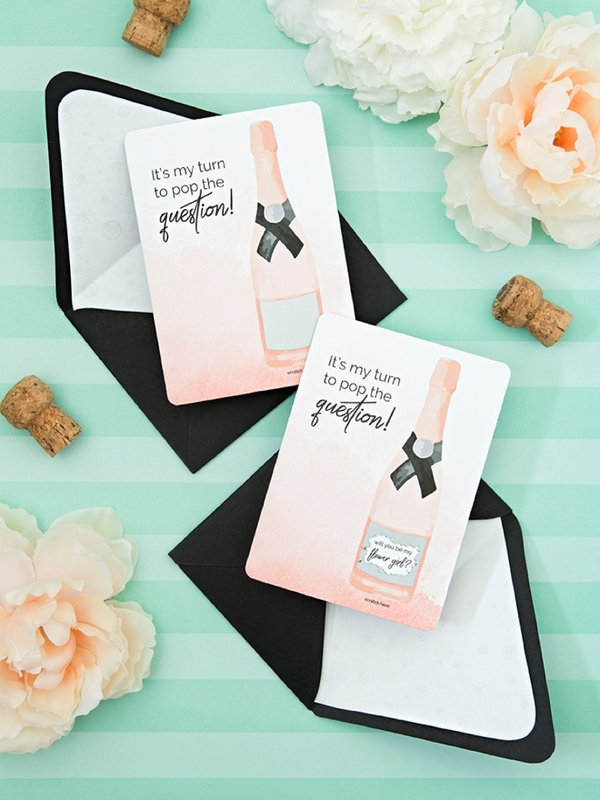 You HAVE To See These DIY Bridesmaid Scratch-off Cards! 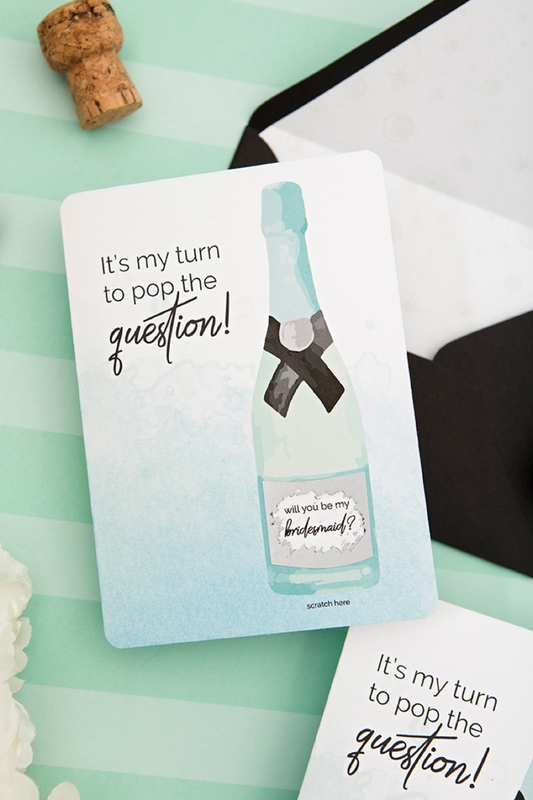 As a newly engaged gal, I imagine that one of your first priorities is popping the question to your bridesmaids! The more personal and the more creative you get, the better (at least to me). 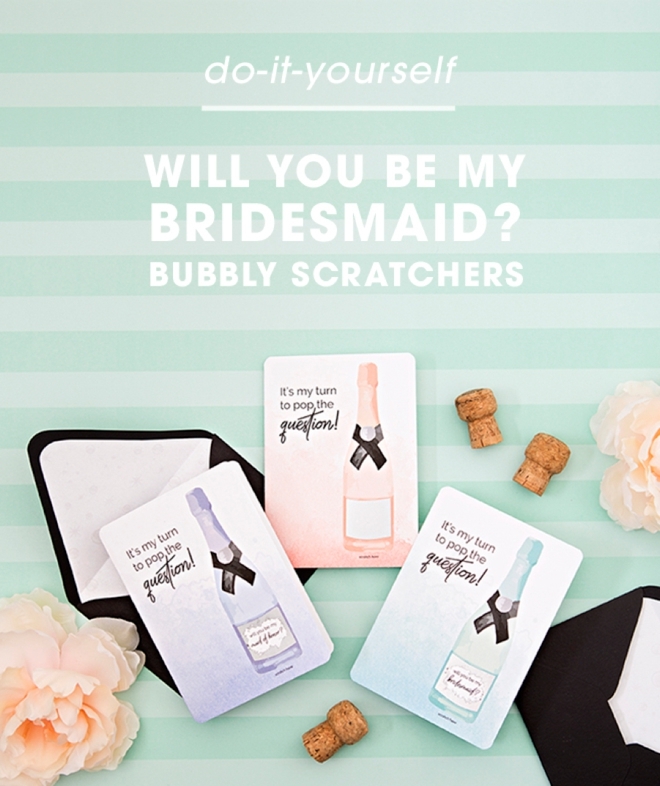 So today, with a little help from Canon we’re sharing these free, printable DIY Will You Be My Bridesmaid Scratch-off Cards! 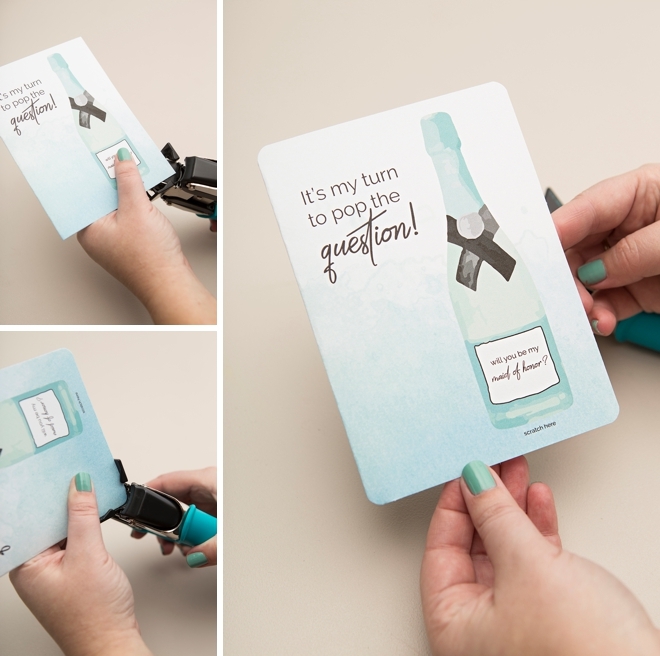 Your home printer, white cardstock and scratch-off label sheet is all you’ll need to create a moment that you and your besties will remember forever. 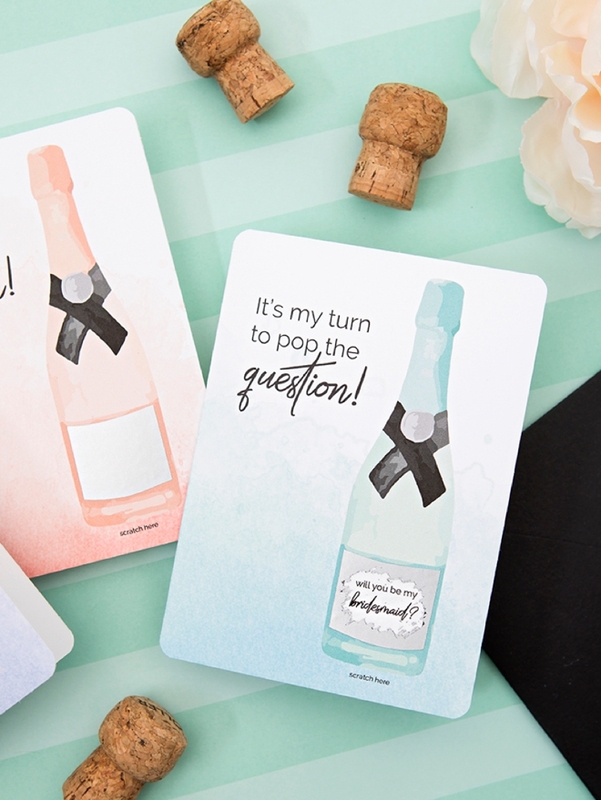 Don’t forget to bring some bubbly to toast with once they say YES! 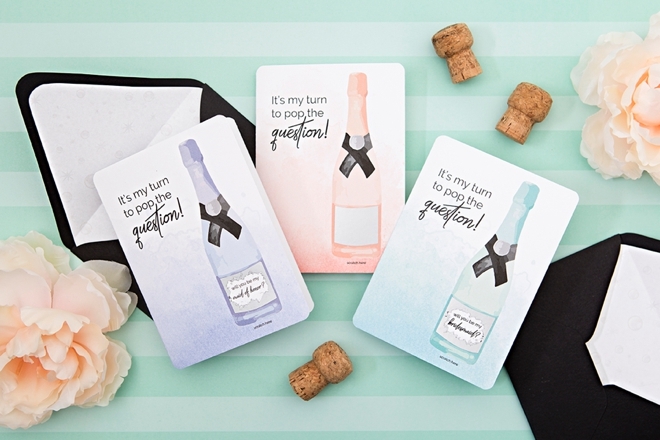 We’re sharing the printable card files for all the options below in each color, plus a darling bubbly envelope liner! 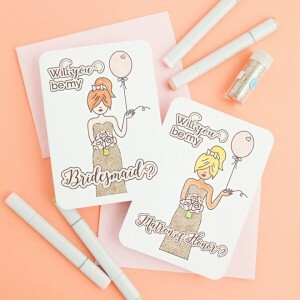 Our FREE printable card designs at the end of the post! 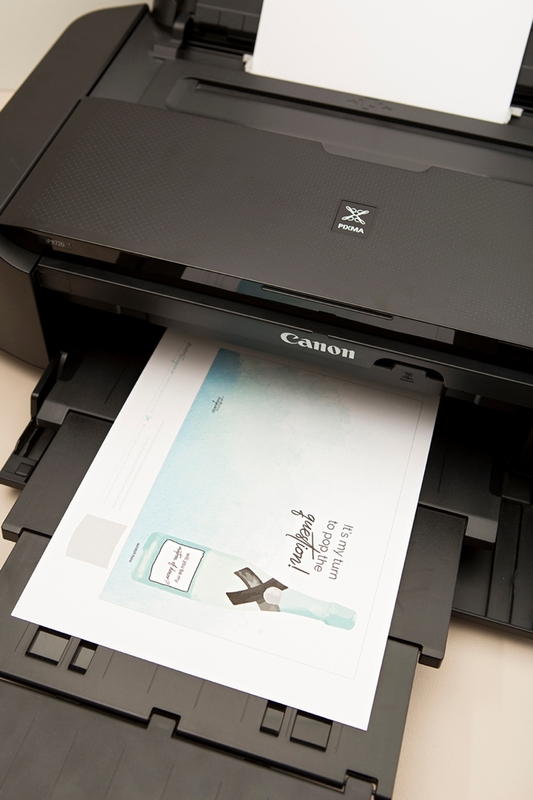 I’m using my Canon PIXMA iP8720 Crafting Printer (my fav!) 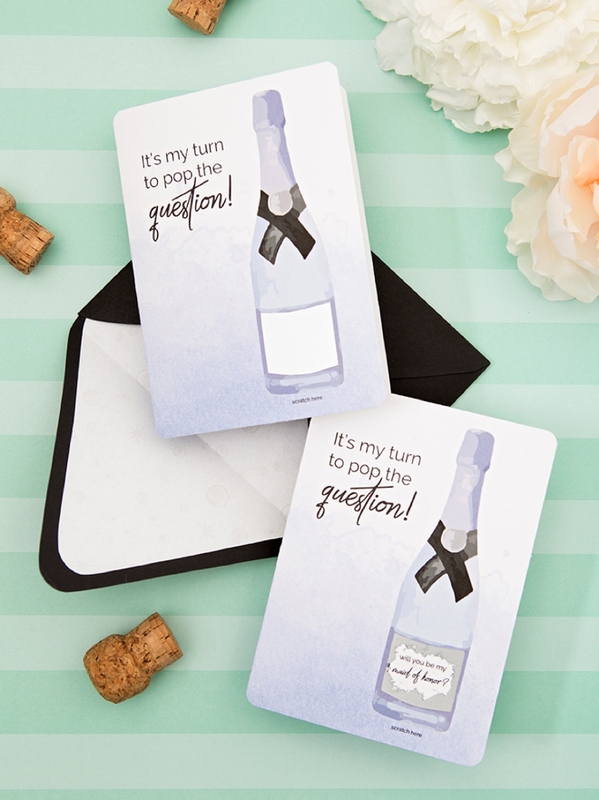 to print these darling cards and envelope liners. I love the back feed option on this printer because it prints on thick papers like a champ and looks good doing it. 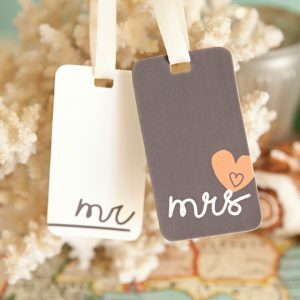 This design cuts down to 9″ x 6.25″ to fold into an A6 sized card (4.5″ x 6.25″). 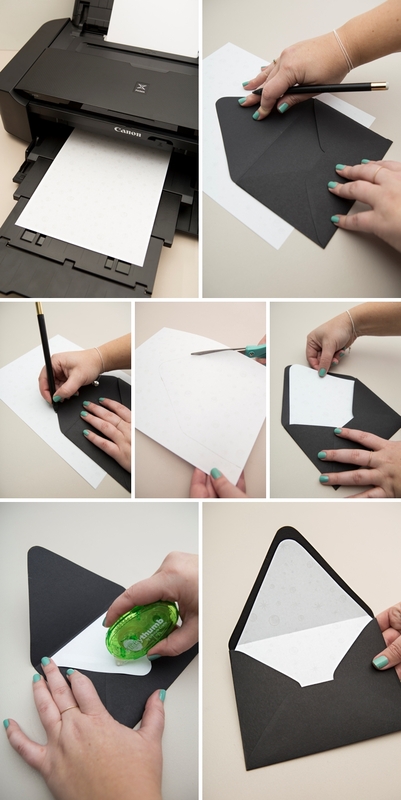 Use a paper trimmer or scissors and then fold the card in half. 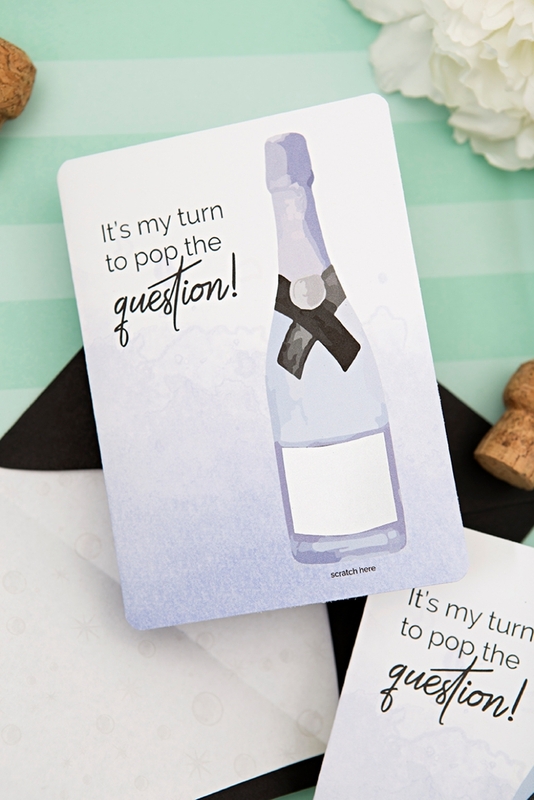 Rounding the corners of the card is totally optional but I think it adds a lovely touch. 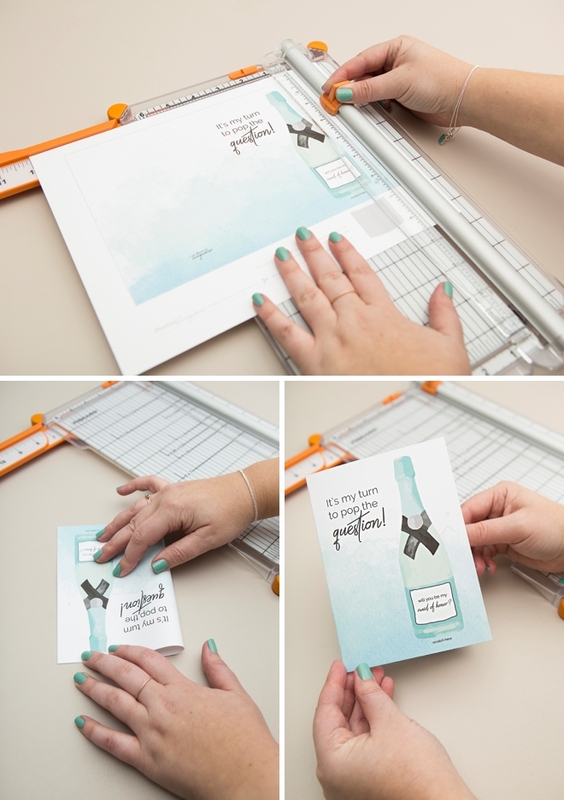 On the printable, cut out the small gray label shape – this is the template for you to use to cut out the scratch-off label. 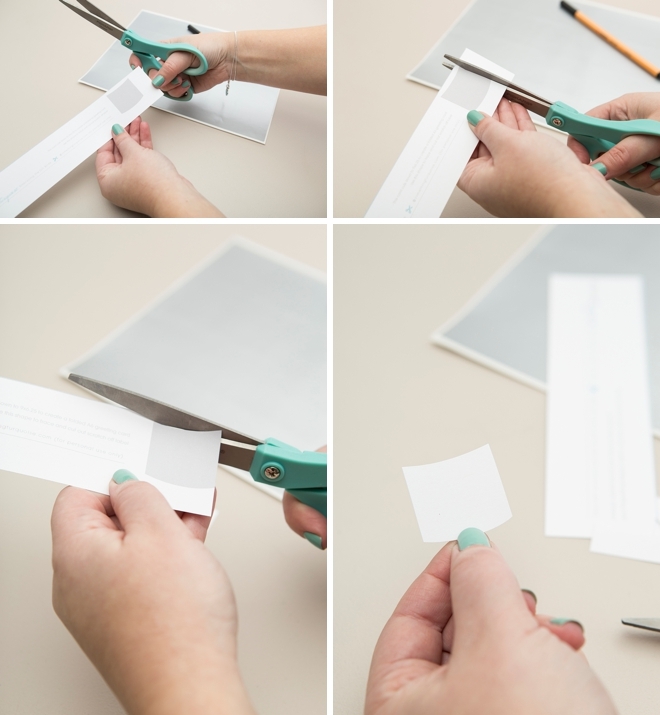 Trace the label template onto the 8.5″ x 11″ scratch-off label sheet and then cut out. 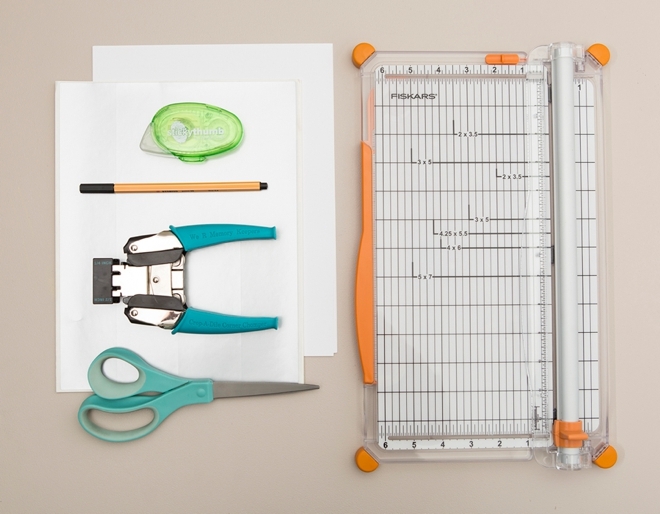 This label sheet is one giant sheet of scratcher material that you can cut any shape from! 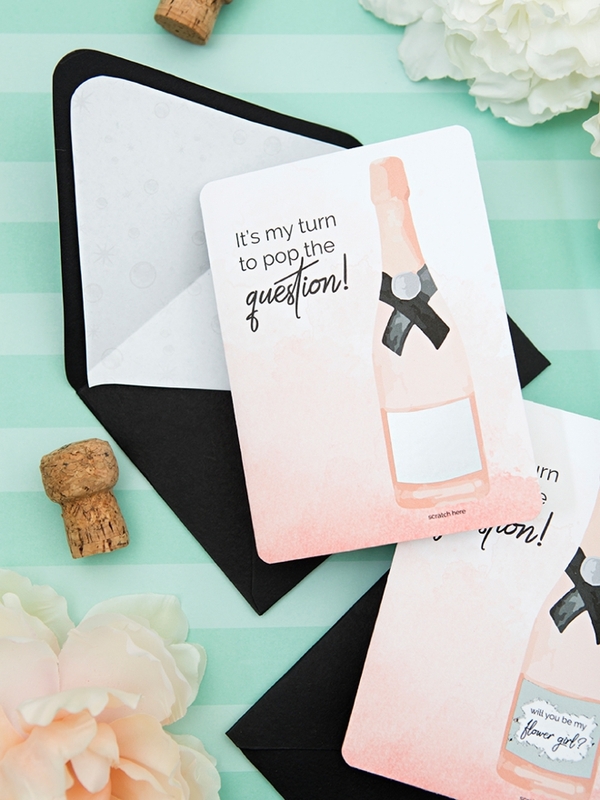 Peel the backing from the scratch-off label and adhere on top of the “will you be my….” area on the bottle to look like the label of the champagne. 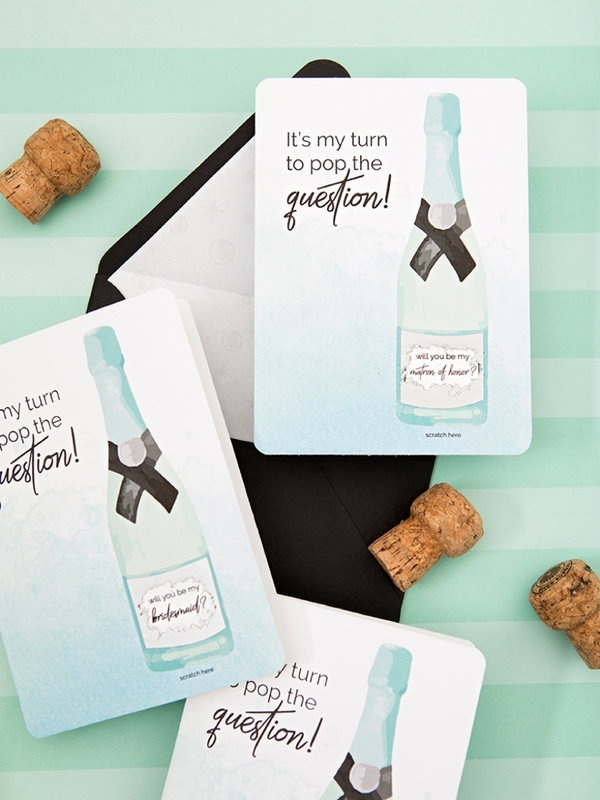 Then your friends get to scratch to reveal the question you’re popping! I love envelope liners and they are so EASY to create. 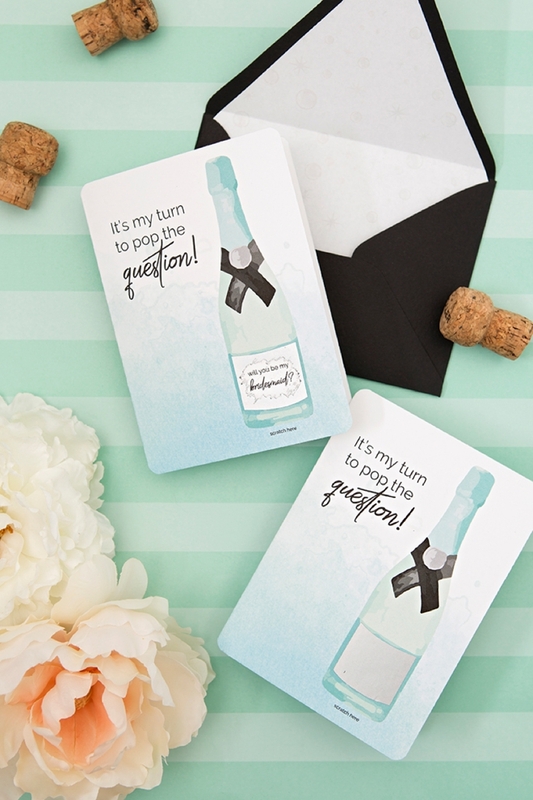 Print our bubbly design onto regular white printer paper and then trace the flap of your envelope. 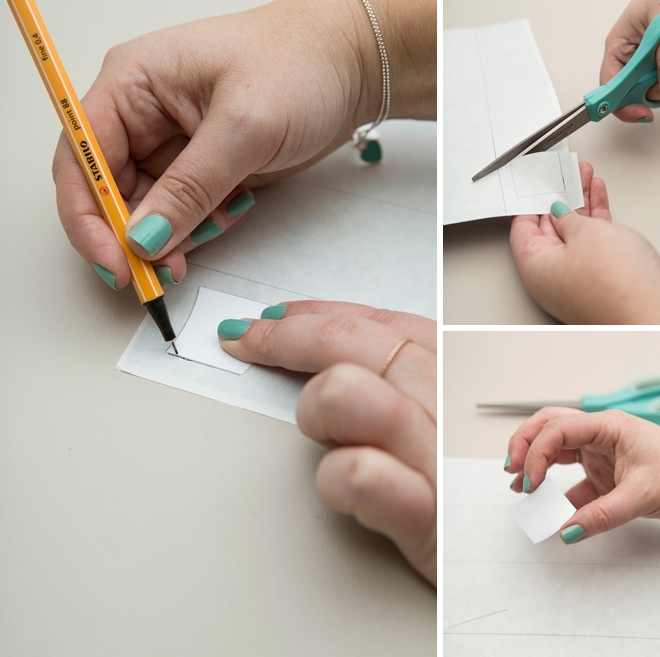 Cut about 1/8″ within the trace line and slip into the envelope. Add a bit of adhesive to the top flap and voila ~ your envelope is now fancy!